Keys in the quarters and be standing there without one bit of energy. Williams says she’s feeling better and that she has been able to practice. She feels like a fulltime player again instead of an on-again, off-again one. Because of the Sjogren’s, she was searching for a new normal. Since then, she hasn’t done much. It has been painful watching her, because she also started to get old and lose her nerve. And she could be awful. I think Williams has found her new normal. If this is how her body is going to feel, then I don’t see why she can’t be a viable, valuable player for three more years. By that, I mean she can have runs deep in majors. She is not going to be as good as she was when she was young. Williams is a mystery, and that’s partly because she can be so secretive about her health. A day or two after she told me about never feeling normal again, her agent called and said she was worried about what she had divulged to me and what I would write. But now, she says she has changed her diet and her practice schedule, with shorter, more intense workouts. If this is a one-time thing, then why has her ranking been climbing? She is back up to No. 18. And why did she win her first tournament of the year, beating Caroline Wozniacki? 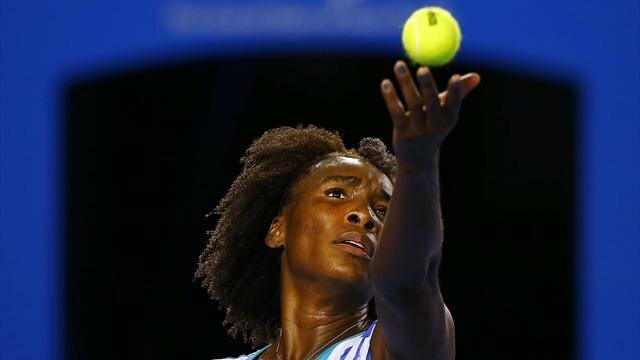 Venus is moving so well, too, with better all those little adjustment steps and not those big gangly strides. That is the most amazing thing. Williams doesn’t seem to be adapting to old age. Now, this isn’t going to be the setup when Williams plays Keys. It’s the old-young thing. Keys, who’s 19, started playing when she was and saw how Venus was dressed on TV. It is actually amazing how much Williams has meant toward getting people into the game: her background, race, style. And all those Wimbledon titles, of course. I’ll take Venus. The tennis gods can come back later. She’s not ready for their kindness just yet. This entry was posted on Tuesday, January 27th, 2015 at 12:56 am	and tagged with Aga Radwanska, AustralianOpen, Madison Keys, Venus Williams and posted in Aga Radwanska, Australian Open, Madison Keys, Venus Williams. You can follow any responses to this entry through the RSS 2.0 feed.